The BioRad Bio-Plex Pro II Microplate Wash Station turns your manual wash steps and automates them in an easy to use, easy to program unit. Using an automated microplate wash station not only helps boost productivity and efficiency by being hands free, but helps to ensure reliable repeatable results. This magnetic microplate washer comes preset with programs optimized for Bio-Plex assays but are compatible with any standard xMAP assay. The Bio-Plex Pro II Microplate Wash Station has a capacity of one 96-well plate, and uses up to 4 channels for dispensing with an 8-channel manifold. This plate washer has a RS-232 communication interface, and is controlled via a 4-key membrane keyboard, displaying on a 2 row, 16-digit LCD screen. 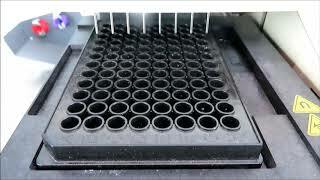 This Bio-Rad Bio-Plex Pro II Microplate Wash Station has been thoroughly inspected and is performing to expectations. All of our lab equipment comes backed with our standard warranty. Should you have any questions, please don't hesitate to contact us.